The first step for getting your blog noticed is creating useful and compelling content. In addition, your content needs to resonate well with your audience. In other words, your content needs to vibe with your readers. It needs to be clear and problem-solving. And in addition to those things above, your content needs to make sense. It needs to be free from spelling and grammatical errors, and be readable by a wide audience, and not to forget, be optimized for SEO too. But on the topic of SEO, here’s the thing. Some bloggers are overly obsessed with SEO and creating more content for the purpose of driving search engine traffic. Now there’s nothing wrong with this strategy, however, it can end up biting you in the backside at some point. You see, you should never rely on just one single traffic source to your blog. You already know my story about relying on Google for traffic, it was one of the biggest mistakes I made when I started blogging. Check out the screenshot below. 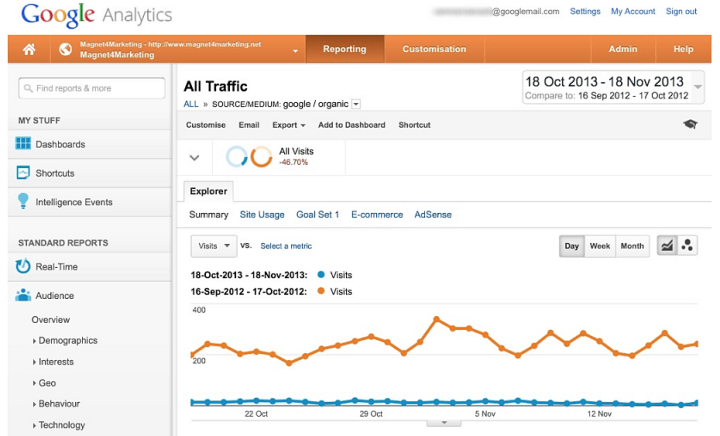 It shows my Google organic traffic in 2013 compared with 2012. As you can see, my organic traffic practically flatlined during 2012. This was the result of relying on Google Organic Traffic alone for my blog traffic, and the result of Google Panda and Penguin updates. So anyway, to get back on track, as a blogger, you don’t actually need to create more content to get noticed. You can still drive traffic, readers, and get comments and social shares by publishing less, and more over, by writing for the benefit of your readers. I’m not at all against writing for the benefit of increasing search engine traffic. Organic traffic, from Google especially, is critical to the success of any online business or blog. After all, that’s where your potential readers and customers will start when looking for your content, products or services, right? My argument is that you should not just put all your eggs in one basket, in this case, rely on organic traffic alone to grow your blog. Blog promotion is something a lot of bloggers, especially newbies, fail to understand the importance of. Of course, creating quality content is extremely important, however, without doing proper marketing, what is the point of creating great content that no one will see or read? I’m sure you’ve heard of the 80/20 rule in blogging, right? Derek Halpern from Social Triggers believes that blog writing should take about 20% of your time. The other 80% of your time you should be focused on doing blog promotion. Personally, I think that’s a solid strategy to follow, and it’s one that I’ve been leaning towards doing more of myself as a blogger. I recently carried out a small experiment over a five week period. I decided to write and publish less and focus more on content marketing and promotion. The result I saw was increased traffic, comments, and even social shares. If you don’t believe me, check out the screenshot below. As you can see, the last four posts I published saw more of everything, all because I paid more attention to marketing and promotion. You see, you don’t get your blog noticed by writing more. You get your blog noticed by writing less. By writing high quality, compelling, useful content. Then promoting it like your life depends on it. You don’t need to spend huge amounts of your time doing keyword research for the perfect topic, writing a post designed for doing nothing other than driving search engine traffic. What you need to do is spend more time writing great content that your loyal REAL human readers will love to read, comment on and share with their friends. Here are some things you can do to help you get your blog noticed without Google or doing SEO. I’m sure you’re already doing some of these right now. How many times have you heard this piece of advice? It’s not news to anyone that list building is important. Are you building your email list? You want to know how I get folks flocking to my latest blog post, reading, sharing and commenting, every time? It’s simple, I send out an email newsletter letting them know there’s a new post on my blog! I bet some of you reading this aren’t even bothered about building an email list. 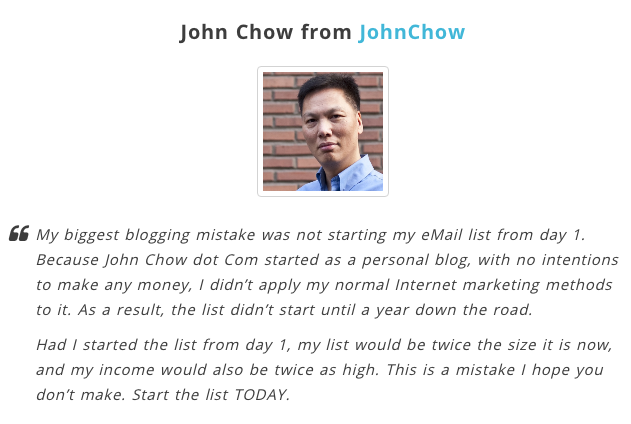 One of the biggest mistakes many bloggers admit to making when they started out was that they didn’t pay attention to building their email list. The quote below is taken from that post. Don’t become another statistic, focus on building your list now! 44% of email recipients made at least one purchase last year, based on a promotional email. Source. That means if you’re not growing your email list now, you’re not growing your customer base either, and you’re missing out on potential revenue to your blog. According to the Content Marketing Institute, only 6% of bloggers publish original content as guest posts. Meaning the rest of the time bloggers prefer to make their blog the central hub for valuable information and great content. Regardless of this statistic, guest blogging is far from being dead, just in case you were wondering. Guest blogging, in fact, has to be up there amongst some of the greatest strategies to get your blog and content noticed by new audiences, and, of course, guest blogging is great for driving traffic and readers. It’s probably much harder to get the results you want from guest blogging as far as SEO and backlinks are concerned these days, however, it can still work effectively to some degree. A few years ago, it was certainly a lot easier to submit a couple of guest posts and get good results as far as SEO goes. These days, though, using guest blogging to improve keyword rankings is a bit risky. 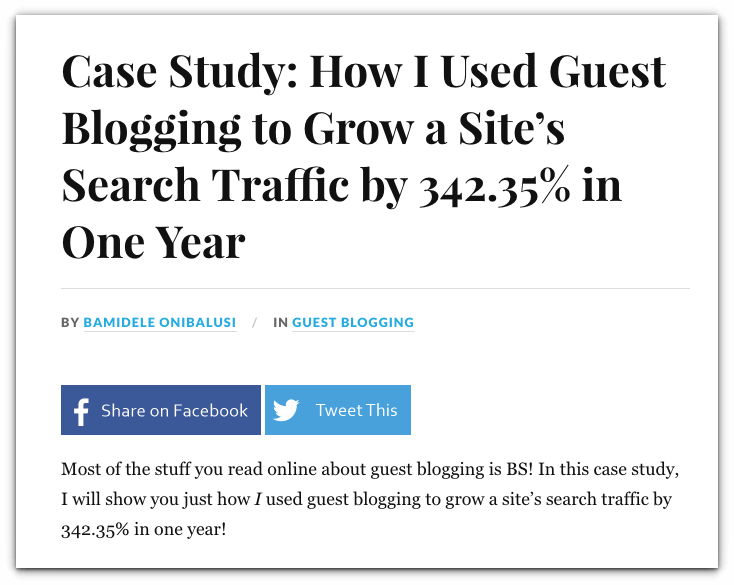 That being said, on the point of guest blogging for SEO, Bamidele Onibalusi was able to increase his search engine traffic by a whopping 342.45% using guest blogging. He shares his full case study in this post. The benefits of doing quality guest blogging, however, goes beyond SEO and gaining some backlinks for traffic and all the rest of it. Writing for other blogs is your opportunity to shine as an authority blogger. It’s your opportunity to tap into a brand new audience network and share your knowledge, expertise, and experiences. It’s also your opportunity to promote your own content and bring visitors back to your blog, helping you build your own blog community. So how and where do you even start with guest blogging? Well, if you’ve never done guest blogging before, to begin, I would recommend you start following a few blogs in your niche or industry. Follow no more than a handful of blogs you like, and read their content as frequently as possible. Get a feel of the writing style and vibe the blog author puts out through his or her content. Read what kind of comments everyone else is posting. Add value by leaving useful and meaningful comments on the blogs you read frequently. Connect and establish a relationship with the blog author and other readers of the blog, that’s very important. Follow the blog author on all social media outlets. Frequently share the author’s content on your own social network profiles. You see, the key here is to win the trust of other bloggers before pitching your guest post ideas to them. If you just go straight in and pitch your guest posts to a blog owner before you’ve even learned anything about the blog or the author, be prepared to be rejected. 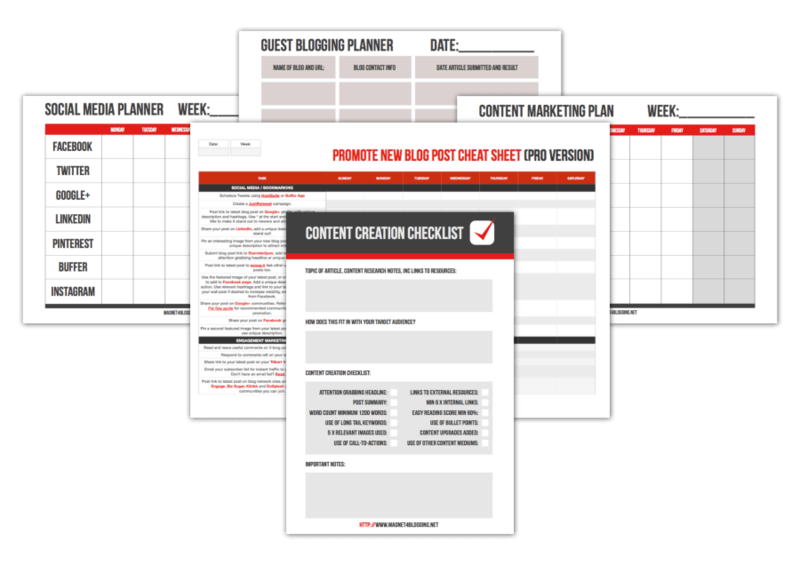 Recommended resource: My latest traffic strategy guide and workbook contains useful printable worksheets, cheatsheets and checklists to help you stay organised with your guest blogging marketing efforts. Blog commenting is another great way to get your blog noticed. When you leave meaningful comments on other blogs, something truly amazing happens. You start to make new connections. Eventually, those connections turn into friendships, and when you publish a post on your blog worth reading, you can promote your post to your friends you made through commenting on other blogs. Perhaps some of them follow you on Twitter or Facebook. Perhaps some of them have visited your blog and subscribed. Connect with other like minded bloggers and influencers in your niche. Share your knowledge, expertise, and experiences. Add value to a post through blog commenting. To make friends, build relationships and eventually promote your content to them. Blog commenting and guest blogging is perhaps two ‘old school blog marketing strategies’ that are still by far the best ways to get your blog noticed, so make sure you’re making the most of these two techniques. So how can you achieve the three things I mentioned above with simple blog commenting? Each comment you leave on other blogs has to be useful and meaningful. It needs to add value to the content of the post and the conversation. Your comments should NOT be one liners, but moreover, a few paragraphs of well thought out text. Sherman Smith runs a really great blog on online business and entrepreneurship. Below is a classic example of a well-constructed comment I left on one of his recent blog posts. As you will notice it’s not just a few lines of text. I’m not just saying, ‘Yes Sherman, thanks for a lovely post’ like you see so many bloggers doing these days. In the comment, I share my own thoughts, knowledge, and experiences. I add value to the content and conversation. Always address the author by his or her first name. Write about why you agree or disagree with the topic being discussed in the post. Share your thoughts, knowledge, and experiences. Add additional value, mention something that hasn’t already been covered in the article. Sign off thanking the author for a great piece of writing. Don’t spam by dropping links in your comment, or by writing self-promotional crap. Always check back to see if the author has responded with any questions so that you can answer them and keep the conversation flowing. #4. Network and outreach like a boss! Blogging isn’t just about creating great content, it’s also about making those all important connections, networking, building relationships and serving a loyal community, right? Networking and reaching out to influencers in your industry are some powerful tactics for getting the word out about your blog, your content and more importantly, for learning new things. Illiyanastareva.com shares an interesting statistic: 93% of marketing pros are getting results in increasing visibility, through influencer engagement strategies! A lot of bloggers, however, are somewhat confused about networking or doing blogger outreach (often known as influencer marketing). Where does one actually start to network to find blogs to collaborate with, as well as find traffic and readers for their blog? Have you heard of sites like Inbound.org, BizSugar.com, or NinjaOutreach and BlogDash,even? Well, if you haven’t, these are all platforms in which you can join and network with other great like minded folks in your niche. People like you. In addition, you can use many of these sites to help promote your own content and find new readers for your blog. 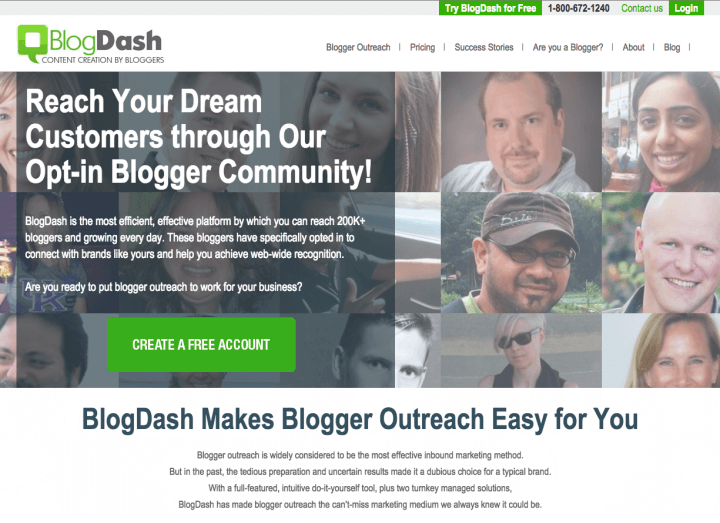 With BlogDash, for example, you can potentially reach out to many the 200K bloggers registered on the site. NinjaOutreach also has 25 million websites in their database and growing. This is a fantastic site and opportunity for finding blogs, bloggers, experts and influencers to connect with and network with. If you’ve never networked or done influencer marketing before, now’s the time to start learning and reaping the benefits. You can either outsource this service, of course or check out what these top bloggers have to teach you about doing blogger outreach. Finally, social media can really help you drive traffic, increase readership and generally get your blog and content noticed by a HUGE audience. As of right now, there are a staggering 2 billion active users on Facebook (source). 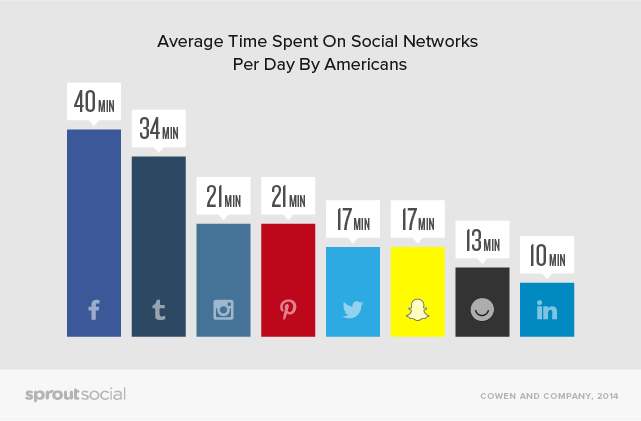 The chart below, taken from SproutSocial, shows that the average American spends around 40-minutes per-day just on Facebook. With Twitter following with 34 minutes and so forth. But here’s what I’m thinking. Chances are you’re already using every social platform under the sun to promote your blog content right now, and there’s quite a selection these days, right? So how is it all going for you? What’s working and what isn’t? Considering many of today’s social platforms are now pay-to-play. How to dominate social media without being everywhere, and, without breaking the bank! When I say dominate, I don’t mean for you to literally be everywhere, on every God-given social platform available. That’s simply not possible nor is it effective. What I mean is to dominate the platforms that are already working for you, right now. Workout where your target audience is. Which social platforms they’re mostly hanging around on, and which are giving you the best possible traffic and ROI, and dominate those platforms, like a boss. Once you figure out where your target audience is, create an effective content schedule, grow your fan base, share content that’s both useful and content that will promote further engagement. 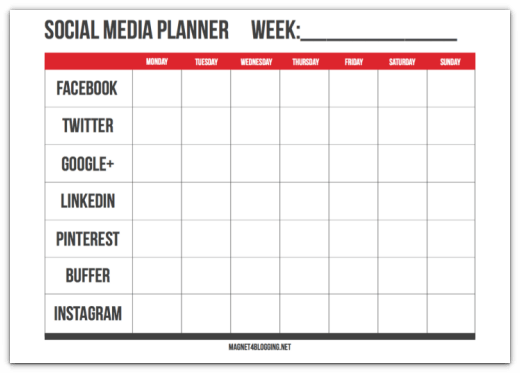 To help you get the most from your social media promo campaigns, I’ve created a useful series of printable social media planners that comes with my blog traffic strategy guide. Be sure to download it and make good use of it here. Here are some recommended tools you can use to help you make your social media marketing work. Smart bloggers don’t just rely on one single source for generating traffic or getting their blog and content noticed. And, you should most definitely not put all of your eggs in one basket either, meaning relying on SEO or Google alone for your blog traffic. You don’t need to waste a ton of money on ineffective advertising either because there’s plenty of other tried-and-tested methods out there for driving targeted blog traffic. If you’re just starting out and want to get more views on your posts, more readers, subscribers and even buyers to your blog, I hope that reading through these five tips above have been more than helpful. Take one of these tactics and make it really work for you before moving onto the next, I’d love to hear what results you get from them.